Get ready for Skirmish! VT - A next-gen Virtual TableTop software that will make you experience your Pen & Paper Role Playing Games like never before! Powerful, yet simple to use, it comes with an extensive set of features accompanied by a hi-quality asset library. And that's just the beginning! Its powerful plug-in system lets anyone edit, expand or modify it to truly reflect the way you like to play. Want to see some of the current features? Vision-management has never been this easy. Use our nifty mapping tool to add walls, doors and windows within seconds... done! Scared of the dark? That’s OK! Our system also allows you to set dynamic light sources (bright or dim) as well as different vision types (normal / low light / darkvision). All the basics are covered. And it is all calculated automatically and in real time! Forget about the tedious work of manual vision-management once and for all and just keep gaming. As in any modern tactical game simulation you can choose between different FoW modes to simulate various exploration scenarios. 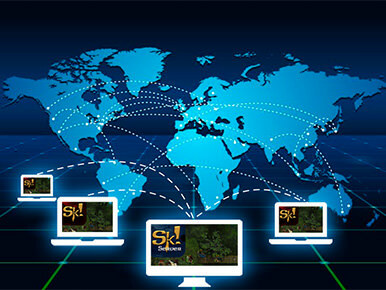 Thanks to the extensible plug-in architecture you can customize Skirmish! VT to suit your gaming needs by allowing you to add, edit, remove and adjust the plug-ins as you desire. Still, if our evolving set of default plug-ins cannot suit your gaming needs for some reason, there will be an open API (C#) that will allow any programmer friend of yours to go forth and create one specially tailored for your game. How powerful is this? Well, all the following built-in plug-ins are created with it, so... “quite a bit”. The global dice roller contains default dice from d4 to d20, but any other custom dice expression such as exploding dice mechanics is possible as well (dice expression manual coming soon). Set up a list of standard actions/rolls for each character and then roll them to see a report with the name of the character rolling the skill, the skill rolled and the roll result in the status window. A database of abilities, skills and anything else related to character stats. Acts as data hub for you as well as other plug-ins. Adds customizable meters such as health bars, mana bars or stamina bars to your characters. Let's you restrict character movement for turn-based gameplay. But it doesn't end there! Check our planned features list below to see more. Only got a single machine? Play local with one screen and seamlessly switch between DM and player mode, or get an extra screen and show your players only what they need to see while you keep your evil plans to yourself. You and your proud “I-bring-my-laptop-everywhere” friends like to hang out together? Even better! Let them connect via LAN and assign one or more characters to each of your players. You must gather your party before venturing forth? Never again! Let them join from anywhere thanks to the power of the internet. That is, until your PC explodes. Need a hand crafting that new map of yours? Collaborate! No need to manually send tokens, files, maps... Just load and get synchronized. Our smart asset cache will ensure players don’t need to re-download anything more than once, ever. Don’t want to let your players roam around freely? Fine! Don’t want to let your players see the NPCs stats? Or maybe you do? No problem! Want the players to see only what their characters can see? Or maybe what the whole party sees? Up to you! Get reports on anything your players are doing while you are not looking. Out of character and in character. The ever growing library of maps, tokens and effects available within Skirmish! VT offers an immense variety of different uses. With maps featuring lots of styles and locations to suit your gaming needs and tokens representing a multitude of critters and standard RPG classes, you will be able to get those quick random encounters rolling in a *snap*. Still can’t seem to find the token or map you need? Custom graphics are possible so you can import your own graphics such as portraits, tokens, etc. Whether you are engaging in a gritty war simulation or atmospheric RPG, our Navigation Tools will make your life easier. Seamless zooming, smooth panning... even a Mini-Map for your tactical pleasure. We know that maps don't always snap to a perfect grid, so we will add an "unsnapped" drawing mode which will enable maps of any shape and size to work with the Skirmish! Fog of War. Upgrades Skirmish! light sources with a more vivid look, such as flickering. A built-in map editor using easy-to-use texture paint options as well as graphical presets in the art-style of the official Skirmish! VT maps for users to create their own beautiful maps in a breeze. Actions and skills entered in the character stats plug-in will be placed in this bar automatically based on the available skills of the selected character. For example, Mandalf the Magician has 6 points in Detect Magic so the Detect Magic skill will automatically show up in his quick action bar. For example, clicking attack on a character's quick action bar will then ask for its target and then any required rolls. Clearly and beautifully show the result of your dice rolls with beautiful dice symbols. Meaner, faster and even more customizable. Make rolls directly from it, make it look exactly like the paper character sheet of your gaming system of choice. Thanks to the new Path-Finding we will adapt the Movement Restrictor plug-in to only show exactly where you can move with your currently available movement points, taking into account walls and other obstacles (X-COM style). Create a customizable set of conditions (with your own icons and descriptions or from a preset), apply them to characters and see on your screen who is affected by what. Adds a true turn-based mode to Skirmish! that counts down Initiative, optionally auto-rolling the initiative values from the stats set up in the character stats plug-in and optionally automatically blocking a character's movement until its turn arrives. Enables the DM to give out text or graphical handouts to his players for them to check out whenever they need. 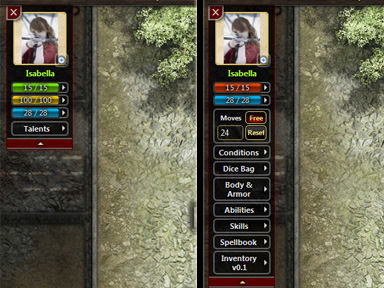 These handouts can also be optionally linked to items such as letters or maps in the Inventory/Loot plug-in. The inventory plug-in adds a complete RPG style inventory. It serves as a display of equipped items as well as items stored in the character’s backpack. The Loot plug-in allows Skirmish! props to be “lootable”. This means PCs and NPCs will be able to store them in their inventory. Choose from a wide selection of Ambient SFX to set the mood for your adventure and stream background music of your choice to your players. Adds a scripting component which allows users to connect plug-in data, actions and the UI with each other to facilitate gameplay or even implement and automate popular game systems. It can even be used to create a testing ground for your own homemade RPGs. Environment example: Connecting 2 switches that need to be pressed at the same time to change the door state from closed to open and the switch animation from on to off when triggered. Game System example: Character #1 puts a sword from his inventory into his empty main hand automatically increasing his attack and damage rolls and enabling him to use feats that can only be performed while holding a sword. If our evolving set of default plug-ins cannot suit your gaming needs we will provide an open API (C#) that will allow any 3rd-party to go forth, create and distribute one with those extra features required to make your gaming experience "just perfect". As we develop Skirmish! the map library will be expanded to cover a wide range of different themes. While the store will allow official (made by us) content at first, we also plan to allow users to distribute free/paid 3rd-party content through it. And like any proper store system, it will include automatic updates and an easy way to download them from within Skirmish! VT itself. 3rd-party content includes Character Tokens, Props, Maps, Games, Plugins, Plugin Presets and any combination of those. Read our FAQ or check our acebook page to learn more.